Location of Stars and Constellations. 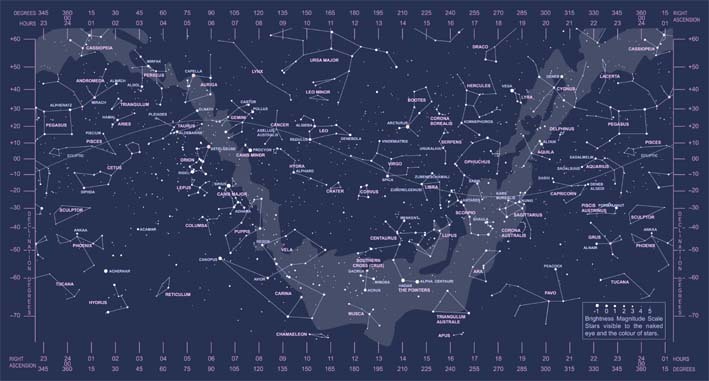 Refer to the sky map that identifies stars and constellations. Course of the Ecliptic throughout the Year. 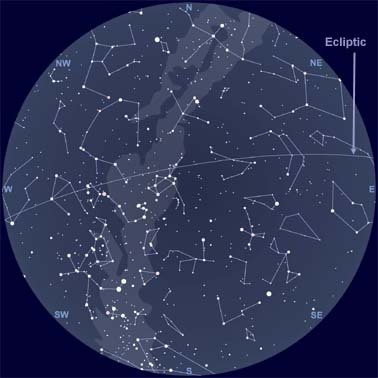 Track how the ecliptic moves during the night and throughout the seasons. Dates to Plot the Sun in Zodiac Constellations. Select any date and find when and where the Sun moves in a Zodiac constellation. The size of an Astroplot chart is 62 cm x 91 cm. The size of an Astroplot chart is 62 cm x 91 cm. A quality print on satin paper, coated with anti-glare varnish. A metallic gold circle frames 12 sky maps. 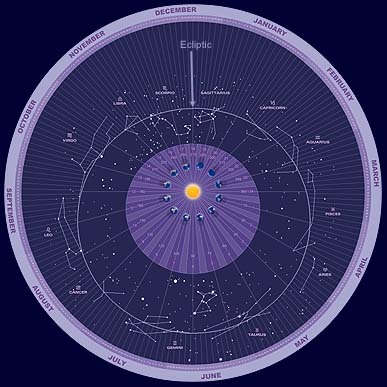 The centre chart features a 365 day calendar that is precisely aligned with RA space coordinates and the Sun's path (ecliptic) across the Zodiac. The bottom chart identifies the names of the major constellations and stars. The passage of the stars, Sun and ecliptic is a consistent annual course. 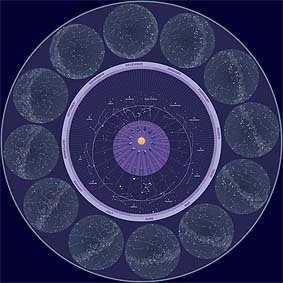 The Astroplot Calendar has 12 charts that show the location of stars in the Southern Hemisphere sky. Next to each month name is a star chart that reflects the night sky around 8 p.m. Months that occur during daylight saving time present the sky at around 9 p.m.
For any selected month, sky views over a 24 hour period for that month are illustrated when the charts are referred to as a series. To locate stars and the path of the ecliptic for a particular time, refer to the 12 charts as a clock. A 2 hour progression of the sky is reflected by referring from one chart to the next. Begin the clock count at 8 p.m. for standard time months. Start counting from 9 p.m. for daylight saving time months. Whatever month you begin from, the "Clock Process" is consistent. For example, to utilize the 24 hour sky reference for September, begin at the September chart that shows the sky at 8 p.m. Step one month clockwise to the October chart for a representation of the September sky at 10 p.m. By moving another step, a two hour progression step, clockwise from October to November, the 12 a.m. September sky is represented. The December chart reflects the sky a 2 a.m. in September, being three 2 hour steps, or plus 6 hours from the starting month. On Astroplot charts, the ecliptic shows the passage of the Sun across the sky. The ecliptic is also a guide to locate the passage of the Moon and planets. Dates to Plot the Sun in Zodiac Constellations. The center of the Astroplot chart is a circle calendar with months and days, dates. Lines extend from dates to the ecliptic. The ecliptic is the apparent path that the Sun travels during a year. The annual ecliptic circuit is plotted through the 12 Zodiac constellations. Refer to the Astroplot Calendar to find when and where the Sun moves in the Zodiac constellations. From a selected date on the circle calendar rim, trace towards the centre. Stop where the ecliptic and dateline meet. On that date, the Sun is in that RA degree of sky. A reference to identify the vicinity of the Sun in the Zodiac constellations for any selected date. On your birthday, the Sun is in the same location every year. .Why does the astrology calendar indicate the Sun is in a different constellation to the actual location? In the centre, the celestial coordinates, right ascension degrees (0 - 360) and hours (0 - 24), are indicated. Refer to the celestial coordinates to plot the location of the Sun, Moon and planets on the ecliptic. The names and symbols of the Zodiac constellations are identified. 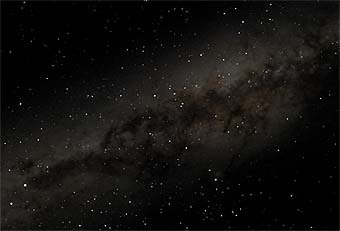 Stars in the vicinity of the Zodiac are shown without their constellation figures. Monthly Chart Plot. Course of the Ecliptic. The Astroplot displays a star chart for each month of the year. A panoramic view of the night sky is displayed with stars and constellation figures. Star magnitudes are indicated so bright stars are prominent as they are in the night sky. What appears as light cloud across the charts is the Milkyway, a view of our galaxy, which is comprised of millions of stars. Each chart shows the ecliptic, being the path the Sun appears to travel across the sky. The Moon and planets travel close to the ecliptic, so it is guide that indicates their rise and set path. The ecliptic path varies throughout the course of 24 hours, with the rise coordinates of the ecliptic slowly shifting between a SE and NE bearing. There is a corresponding pattern shift for the bearings of the setting ecliptic, between SW and NW. Using the "Clock Process" the ecliptic bearings are plotted throughout the night. The time for the rise and set bearings of the ecliptic gradually adjusts relevant to the seasons. Astroplot has 12 star charts, presenting the sky for each month. The September Chart: below. The 'cloud' across the chart represents the millions of star that consist of the Milkyway. Bearings on the chart, indicated in blue, are for orientation. Face north and south is behind. The zenith is directly overhead. The ecliptic, Sun, stars, Moon and planets, rise from the eastern horizon and set below the western horizon. The celestial sphere is an imaginary sphere whose centre is the Earth. Declination is a used to measure the degrees of latitude above or below the celestial equator on the celestial sphere. Right ascension RA is used to measure the degrees of longitude on the celestial sphere. Right ascension begins at 00 at the vernal equinox. 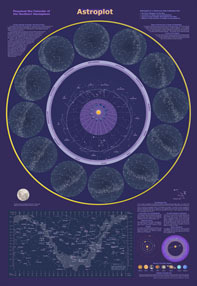 At the bottom of the Astroplot poster is a rectangular star chart (mercator projection) represents the sky that surrounds Earth. The celestial coordinates on the column indicate declination. The row of right ascension coordinates, degrees and hours, match the coordinates on the centre chart. Refer to the chart to identify the names of major stars, written in blue. Prominent constellations names are distinguished in pink. Magnitude Scale indicates the brightness of stars and planets. The scale indicates the brightest star, -1, to 5, the lowest brightness detected by the human eye. Not all stars are white. Some stars have a noticeable colour, such as red for the star Betelgeuse, in Orion. Other stars have a spectral of blue, yellow or orange. Astroplot charts display star spectral. Above: The 'cloud' across the chart represents the millions of star that consist of the Milkyway. Right : From Earth, the Milkyway, a band of compacted stars that look like a river of cloud. The Milkyway, with Scorpio in the middle.